Read this review to understand that Cannabis Software is an investment scam that you have to avoid. 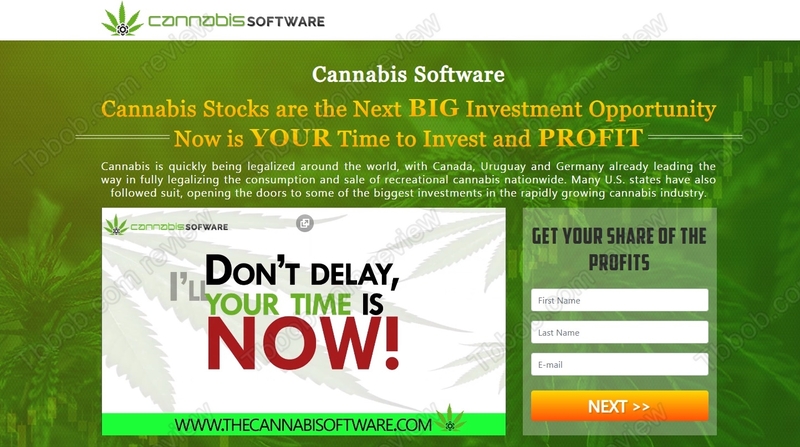 According to its website, Cannabis Software is an automated trading solution for cannabis stocks. The theory behind is that cannabis is being legalized in different parts of the world, so stock of companies dealing with it should rise. And the software allegedly can make you more than $7,000 per day in trading these stocks, for free. Does it sound legit? First of all, if the theory is that cannabis stocks will rise, you just have to buy these stocks and wait, you don’t need an automated software, do you? Secondly, the theory is only a theory, and nobody can predict the future with certainty. As a matter of fact, cannabis stocks have had negative returns during last year, have a look at the Yahoo stats. 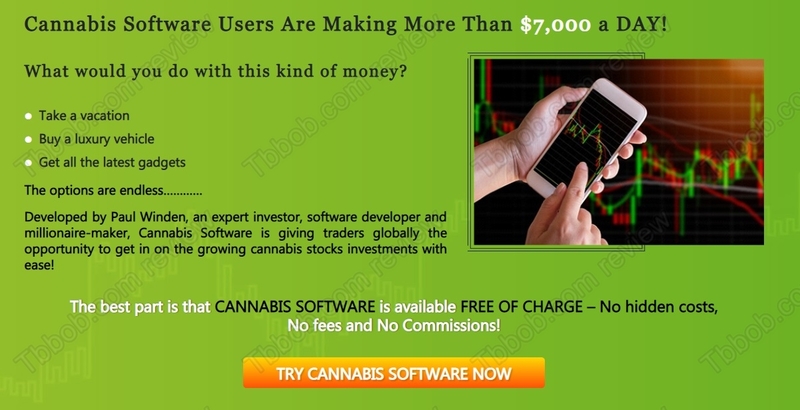 The truth is that Cannabis software is just a scam, lately we’ve seen a bunch of scams riding the cannabis wave, like Cannabis Wealth, Cannabis Trade, Cannabis Millionaire, Weed Profit System or Green Leaf Fortune. They all are the same. All these cannabis scams work the same way. They tell you fairy tales about how quickly you can become rich thanks to their software, but the reality is completely different. 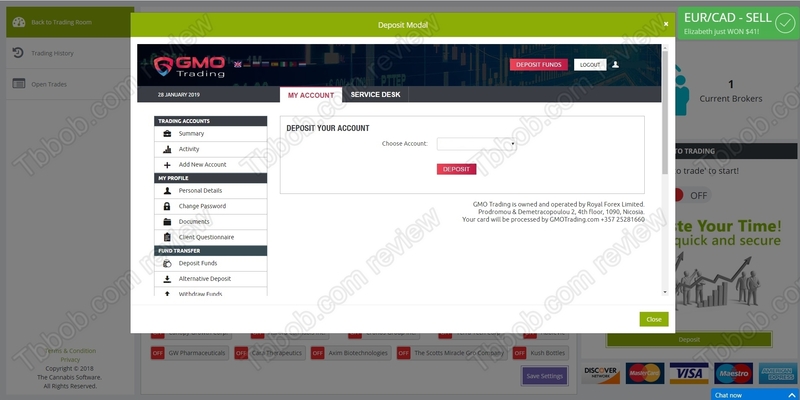 When you sign up, they will open an account for you with a broker of their choice. In the case of Cannabis Software it is GMO Trading. This broker doesn’t even offer cannabis stocks! They will push you to deposit money so that they earn an affiliate commission from the broker for referring you. As soon as you deposit, their software will trade your account to zero. As you can see on our picture, it will be Forex trades, so nothing to do with cannabis stocks. This is how they get your money and make you lose. Cannabis Software is a scam that is made to lose your money in trades that have nothing to do with cannabis, stay away from it! No free software will make you rich. 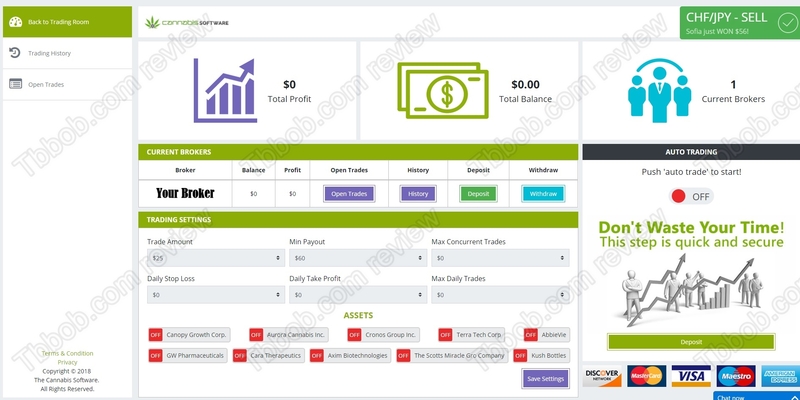 If you want to succeed in trading, start practicing and building a strategy on a free demo account. Don’t trade with real money until your strategy is ready and until you understand the risks.